Large hopper holds up to 2 lb of corn, grain or beans; output is up to 10 lb per hour. Ideal for grinding soft or hard grains for cereal and bread; corn; nut meats; and coffee beans. It will even produce powder-fine, bakery-quality flour if you grind it twice. Grinding plates (3-3⁄4"OD) are made of hardened iron alloy for clog resistance and long life. Plate cover directs corn meal and flour downward into a bowl, preventing messes. Clamps to surfaces up to 1-1⁄2" thick or can be bolted down. Note: If you're shipping this item outside of the U.S., please call for a quote: 1-800-438-5346. * NOTE: This product is drop shipped. This means it is shipped directly from the manufacturer and may take an extra week or two to be delivered. I bought this mill to grind the dent corn I grow in my food plot. It does the job very well allowing me to adjust for coarse grits down to fine cornmeal without too much effort. 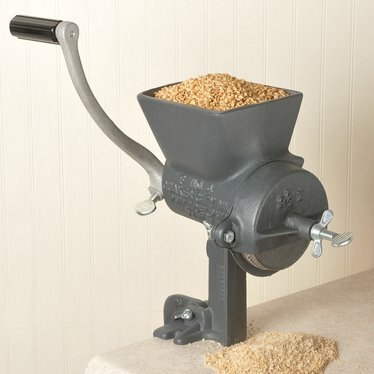 It is a robust heavy duty mill that I would highly recommend to anyone wanting to grind corn for their family. I cannot speak on it's ability to grind other grains as I have not tried it for that. Lehmans shipped it to me up here in Canada fast and trouble-free.